I think this was the sort of team we hoped for earlier in the year. We played ultra conservatively (I'll get to that later), established the run, and frustrated the other team with our defense. It's a good model when you have some limitations, but as we saw yesterday, it also makes for some tense and frustrating moments. BC dominated that game, yet Clemson still had a chance to steal it. But the victory is what is important and now let's run the table. Chase Rettig didn't wow anyone, but I kept asking myself this: "would we have won with this game with Shinskie or Marsco?" I say no. It was the little things that I think he does well, like moving within the pocket to make a play. Hitting crossing routes in tight coverage. He's also resilient. Take the pick 6 for example. After that he came back and was still willing to throw downfield and take chances. He wasn't perfect though. His floater that they intercepted was sloppy. He still has trouble with the short slants. He had a few open men that he missed and he underthrew Momah's big catch. But overall, another big and important step for our young QB. All the running backs played well. Harris was obviously the player of the game. We saw what we already know -- he fights for extra yards and he's got great vision. What we also saw this week was Harris's ability in the open field (on a pass) and that he is getting better at non-zone blocking runs. Some of his better runs inside were between tackles on traps. McCluskey had a nice day and continues to block well. I also think we should use him more in the passing game. I like what I saw from Williams. The OLine looked good again. Although Spinney got overpowered on some plays early, he hung in there and had a good second half. Cleary looked good at Right Tackle and we didn't miss Lapham. Richman and Claiborne were fine. Castonzo played well (although the false start late in the game could have been a killer). The WRs didn't light it up, but they showed that they can get separation and win one on one battles. I was glad to see Momah redeem himself after a few rough games. Swigert did his usual job of getting open and making tough catches. Pantale was solid -- and I thought both TEs blocked well. Lee was back in action and I hope we get him the ball soon. There are moments of brilliance in the play calling -- like throwing to Harris and McCluskey when they are completely uncovered. There was some aggresiveness -- like the throws to Momah. Yet we still had maddening playcalling near the redzone. Points are precious yet we never try anything new in an effort to score TDs. Why not call play action on 1st and goal? We dominated that game and had a dominant performance from our OLine and only had 16 points to show for it. That is on the play calling. I also had a huge problem with our clock eating 3.5 minute drill to end the half with a field goal. Spaz told Raycom that he knew what he has (which I interpreted to mean that he was playing it safe and to our strengths), but once again it is a wasted opportunity. You can't pad a three point lead with 30 minutes to play! Scafe played well. I know he got called for a roughing the passer, but his aggression is much needed. Ramsey was strong. Quinn had a dumb penalty. Edebali and Holloway both played well. What I liked most about Edebali is that he motors. There were so many times when we just rushed three that he was the one still chasing Parker and forcing him into a bad throw. More good tip balls from Herzy. He also made some good open field tackles -- which is impressive with just one hand. KPL was better but still allowed a pass over the middle in what looked like his zone. After some early and unusual missed tackles, Kuechly was great. I am surprised he hasn't had more INTs with the way he closes on people. Devitto made some big plays in special teams. Chris Fox had a heck of a game. I don't know if they decided to pick on him or it was just timing but he was in the middle of a lot of action and came out ahead. Fletcher wasn't tested but still had a nice INT. All the safeties were good, but I want to make mention of Okoroha. He showed good speed and made a score saving tackle early in the game that helped set the tone. Overall I thought the defensive gameplan was good. We did our usual of shutting down the run and forcing them to pass. In the second half things got a little too close for comfort but the strategy won out in the end. I do want to make mention of our use of second teamers tough (and this will sort of sound like a criticism). I thought all our backups played well. Nice games from Holloway and Fox and Okoroha. This compliments previous weeks where guys like Noel and Edebali stepped up. I make mention of this because I always felt Spaz's defenses were always at there best when we rotated a lot of guys in and out. Our second teamers were often as good as the first. Yet in the past two years we've gotten away from that. My guess is that the coaches feel there is a huge talent drop off. As the past few weeks are showing, maybe there is talent on the bench. And you never know who will step up and make a difference. That's why I wish Head Coach Spaz and DC McGovern would start to remember what DC Spaz and position coach McGovern did so well in their previous roles -- and use their second teamers more. The squib was well timed and well executed. We didn't do much in the return game but avoided mistakes. Freese deserves credit for making his kicks on a windy day when his counterpart wasn't. Because so many people think I hate Spaz, let me congratulate him first. As I've mentioned before the difference between disaster and greatness is not that far. Spaz's team was petering on the edge of total meltdown and he got them to respond for a week. Now let's make it two weeks in a row. As for the game, the squib was a good idea. Spaz and the staff also deserve credit for having the second teamers ready to go. As I've hinted at, my biggest problem with what he did was wasting time on the final possession of the first half. With wind like that in Alumni, the field goal wasn't a gimme and a touchdown would have put the game away. But most of all, that sort of conservatism sends a message to his team about Spaz's faith in them. He obviously knows emotion plays a part in the game (see him trying to get guys pumped up in the tunnel). Doesn't he think the FG instead of TD mentality will carry over to his players? Forget recruiting or managing the staff or being the face of the program for a moment. All those things are part of his job. But the ingame decisions are huge and for a team like BC can make a difference between a bowl season and a losing one. The field goal didn't come back to haunt him but playing like that will. But I believe things are turning and hope he has it figured out. There is no one around who will be happier to eat crow if we win out. A win! The sun shines brighter. The sky is bluer. It feels nice. Very proud of the effort on both sides of the ball. I am sure I will nitpick a little after watching it back, but I am happy for the team. Now let's run the table! I woke up with a good feeling. Despite all the evidence saying the season is over, I still believe in these guys. Today begins the turnaround (I hope)! You can leave your thoughts here during the game. You can also join the conversation on the Eagle Insider message boards. I will also be tweeting at times during the game. As I have mentioned this might be our last game of the season on real TV. So use it as an opportunity to watch the game with other BC fans. The Hockey team will raise their latest National Championship banner tonight prior to the game against Merrimack. The ceremony starts at 6:30. The Giants placed Kiwi on IR. In an O.Henry moment for BC fans, it opened up a roster spot for Will Blackmon. The women's soccer team beat Miami in overtime last night. The BC women's basketball team added another local product. BJ Raji is coming into his own in Green Bay. The Pioneer-Press reported that Jags is a candidate for the Minnesota opening. Eagle Action posted an article (since removed) on the two Cincinnati recruits and their upcoming visit. In the article their former St. Xavier teammate Luke Kuechly said this: "My main thing that I'm going to be very honest with them about things." Silly and innocent as it seems, that is an NCAA recruiting violation. The official rule states that schools, players and/or team official cannot speak to any media about specific recruits until after signing day. What happened with Eagle Action is very, very minor and shouldn't be a big concern. BC probably self reported the violation so that no one else would blow the whistle on them and make it look worse. Although I personally haven't done any recruiting reporting for Scout.com since my affiliation with Eagle Insider, Scout has made clear any potential hazards and asked me to hammer home those tricky NCAA gray areas to my contributors (first the BC Draft crew and then the other Scout guys). My interaction with BC folks on recruiting was equally stringent. They wouldn't even broach specifics. That's why this mistake from Eagle Action is so surprising. I've had my issues with EA in the past, but I will give them credit for having the most in-depth BC recruiting coverage for a decade now. They should have known better. When the smoke clears, I don't think anything will come of this. If we don't close on Duggan and Daniels it will most likely be about the program and not the websites. I know a lot of people bemoan the Raycom/ACC Network coverage. I feel they do a decent job. I hope the critics enjoy this week's production because it might be our last televised game of the season. There is still a chance that the Syracuse game will be picked up, but the rest of our ACC slate is likely headed to ESPN3.com. ESPN's video service has made leaps and bounds in its technology and consistency, but it still amounts to watching your game on a computer with D-level announcers. Maybe, just maybe we start our rally this weekend and turn the tide with the TV programmers too. Overlooked storyline for the game: BC is expected to have another great weather day on Saturday. When was the last time we've played this many home games without a rainy wet Saturday? It is nearly November and we've lucked out on the weather. I actually think this has hurt our home field advantage a bit. I think the slippery, wet days are always tougher on the visitor. 1. Break patterns. We've read enough this week about formations and tendencies. Rettig is still raw, but I am sure he can handle three straight passes to start a drive. Play calling is a lot like rock, paper, scissors. We've been throwing rock over and over. Time to mix it up. 2. Get to Parker. This gets a little harder with Albright's injury, but I believe that pressuring him is the key (sort of like we did with Ponder). If we leave him in the pocket to make mistakes, he will pick us apart. 3. Improve 3rd down defense. Another straight forward point based on last week. When BC is at its best defensively, drives -- even on shorten fields -- go for 3 instead of 7. We need to get back to that. -- Dabo Swinney is 4-6 on the road. Last season's offensive struggles in Death Valley were not our worst showing against the Tigers. BC only scored three points against Clemson in the 1940 Cotton Bowl. We scored just two points against the Tigers in 1951 and were shut out in 1952. Nothing really matters at this point. We need to win four of our last five to go to a bowl. It can be done but no one can help us. We already know that our remaining ACC opponents are terrible. The last mystery -- Syracuse -- is off. BC score a touchdown on the opening drive. Spaz will probably defer but I think a statement early could change the course of the game and the season. The Defense isn't perfect. The defense hasn't been the problem this season and it is unfair to ask them to carry the whole load, but that is where we are. If we allow Clemson to score more than 17, I don't think we will win. People have asked me to stop picking BC to help change the momentum. You won't find a more superstitious BC fan on the planet and I would do a million different rituals if they worked but I cannot change this format. First because my design when I put this together was to give a rough blueprint of how BC could win. Secondly, BC's overall record since I started doing these is very good. Finally, I actually think we can and will win this weekend. As I've said all along, we are not as bad as our record. One of these days it will come together. I think this weekend, Clemson waltzes into Boston expecting a beaten team and gets surprised. Here is the update on Sean Duggan at Eagle Insider. This is shaping up to be a huge recruiting weekend for Spaz. Alex Murphy keeps narrowing his list of schools and BC keeps making the cut. I know Donahue and Co are working him hard. BC continues to lead the nation in GSR ratings (the sports grad rate measurement). BCI has a great post on our ineptitude in the redzone. I think the redzone failure is the biggest indictment in the talent vs scheme issue. We are able to move the ball a bit into the redzone yet cannot finish drives. We don't have a goalline/redzone package the we can execute with any consistency. Alex Albright might be able to play in a bowl if we get there. I hope the team uses it as a rallying point. Finally, one of the highlights of Ice Jam. Where to begin with HD's defense of Spaz? I like ESPN ACC Blogger Heather Dinich but today was not one of her better days. She posted something in defense of Spaz that has so many holes and logic missteps that I felt I had to take it apart piece by piece. Her portions will be bold. My responses will be followed by italics. Boston College fans have been quick to criticize coach Frank Spaziani after the program’s 2-5 start. Boston College is heading towards its first losing season since 1998, but it didn’t happen overnight -- and it didn’t happen under Spaziani’s watch. It’s important to remember how the Eagles got here -- a combination of poor recruiting, deflections, coaching changes and injuries. I challenge anyone who says that this season and decline didn't happen on Spaz's watch. He has been the coach for two years and everyone of these five losses. Whose watch did it happen on? How is he blameless in all of this? Spaz has been at BC for 14 years, a coordinator for 10 and head coach for two. It wasn't like he was some intern getting donuts. He was deeply involved in most of the coaching and recruiting. Plus the attrition and injuries happen at every school in the country. It is part of any head coach's job. Former coach Jeff Jagodzinski came from the NFL, where coaching was enough. Recruiting wasn’t his top priority, and it’s showing now. Only 20 of the 44 players BC brought in during the 2007 and 2008 recruiting classes are still in the program. The transfer of tailback Josh Haden put the burden on Montel Harris, who has done his best to carry the load. Haden was/is a nonfactor. Harris is leading the ACC in rushing. His workload is not the reason we cannot score points. More importantly, there has been a significant drop-off in the number of offensive linemen that were recruited. The position, once a strength and part of BC’s tradition, is now incredibly thin. The OL has been a problem, but depth is not the issue of 2010. We had four returning starters, a parttime starter returning in Cleary and an experienced backup at Center in Spinney. Yet as a group they've been lost, overwhelmed and not cohesive. The quarterback position has been equally as troublesome. Dominique Davis, Chris Johnson and Justin Tuggle are gone, and Codi Boek has been moved to fullback. 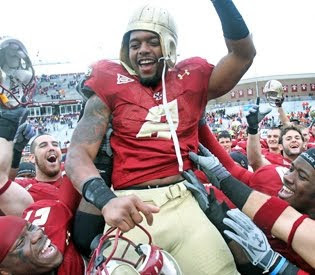 Davis and Tuggle are gone because they were ultimately told they didn't have a future at BC. Spaz and his offensive staff could have kept both. But regardless of what happened with them, is their absence the reason our offense has struggled and regressed? Are they the reason we are tipping plays? Enter Dave Shinskie. Exit Dave Shinskie. Enter true freshman Chase Rettig. It’s going to take some time before he develops into the quarterback those inside and out of the program expect him to be. How can anyone but Spaz be responsible for Dave Shinskie? Shinskie was not inherited. Jags and TOB had nothing to do with him. It was Spaz's decisions to hand the job to Shinskie last year. It was Spaz's job to monitor and judge his progress. It was Spaz who decided to go with Shinskie at the start of the season without giving Rettig time in our first two games (despite the doubts the staff had about Shinskie). The Shinskie situation had its upside (last year) and downside (this year) but it is all Spaz. Injuries have decimated the defense. Last year it was linebackers Mike McLaughlin and the horrific news of Mark Herzlich’s cancer. This year the Eagles lost their top receiver, Colin Larmond Jr., before the season even started, and now their top pass rusher, defensive end Alex Albright, is out for the season with a fractured fibula. Why are we bringing up 2009 injuries? What does McLaughlin have to do with this year? Mark's battle with cancer was devastating but isn't the reason we are struggling now. In fact, I think Mark's play and contributions have been 'house money.' Larmond's injury was a big deal for this year. Finally a point for HD. Albright's injury was also bad luck but he played in these games we lost. Spaziani is the program’s third head coach in four years. The coaches have changed, and the recruiting philosophies have changed. With Spaziani at the helm, though, they’ve changed for the better. I've harped on this before but the coaches and recruiting philosophies haven't changed. 60% of our staff has been here four years, which is very healthy for college football. Our director of football ops and our strength and conditioning coach are the same. We've had the same recruiting coordinator for four years. Is that change? Possibly the worst thing that could have happened to him last year was to win eight games. Not enough people realize what an accomplishment that was, considering all of the obstacles Spaziani was faced with. It was a Coach of the Year-worthy performance. This year, there’s simply no more miracles. Boston College has one of the worst offenses in the country. It’s not going to change in the next five weeks. Especially when it took a few years to reach this point. The eight wins in 2009 was the best thing that could have happened to Spaz. If we had a 2-10 season last year and followed it with our current stinker, Spaz's seat would be on fire. 2009 bought him some good will that he will need soon. HD finally mentions that BC has one of the worst offenses in the country. I didn't come into this year thinking we would score at will but there were enough pieces (Harris, the returning OL, the deep TEs) to put together a more consistent attack. I want to focus on HD's point about attrition. I sense this becoming part of the excuse narrative to shift blame away from Spaz. It really is hollow though. Attrition is normal for college football. At any time there should be five recruiting classes worth of players contributing to one season. It is up to the staff to find the best players, put them in the right spots, make them better and give them a good game plan. But for comparison let's look attrition during two past BC seasons. First 2008 (Jags's second year). I tried to make the comparison as relevant as the 2008 and 2007 classes are to Spaz's 2010 season, so I looked at the 2005 and 2006 classes. 15 signees and only 9 were on the roster in 2008. Look at those names. Some were stars. Some barely played in 2008 but were still around. At the end of the day, their attrition 68% was better than Spaz's current 57%. However, bodies matter more than percentage and Spaz has 27 guys playing for him from those classes while Jags only had 24. But let's also look at one of TOB's season. I picked 2003 since that was a year where we struggled with QB issues and rallied late to turn the season around. For this to compare to Spaz, I selected the 2000 and 2001 classes. 17 signees and only 9 were on the roster in 2003. 15 signees and 12 were on the roster in 2003. This group had an attrition rate of 65%. Healthier than Spaz's current but not as good as Jags' dealt with in 2008. Yet once again there were only 21 players from these classes on the roster in 2003. I don't want to go player by player, but look back at those classes. There is a mix of talent and busts as there always is with recruiting. We are not the most talented team in the country but our talent level is not drastically different from some other BC transition years. The difference between now and those years is how we are using the talent. USA Hockey and the NHL selected Jerry York as their annual Lester Patrick Award recipient. The honor is bestowed on contributors to the game. Congrats. Aside from trying to snap the losing streak, Spaz also has to use this weekend to reenergize recruiting. Two of our main targets will be at the Clemson game. A local prospect that BC was targeting is headed to Nebraska. The bowl we all hope BC will sneak into has a new name. I've had Oregon ranked high from the outset of the season yet had only seen bits and pieces of the team. This week I was able to watch them annihilate UCLA. They look like they could beat any team in the country with ease. With all that said, I probably just jinxed them. I was tempted to rank Syracuse, but the still have a lot of softness on their resume. This is from last week, but it remains good stuff. Donahue comes off as a good teacher and witty. Here is a Donahue Q&A from bceagles.com. BC released his depth chart for Clemson. Curiously Shinskie is still off. Is there more to the story than a concussion? The Wake game will be on ESPN3.com. Get used to games on your laptop. Ryan Purvis has been promoted from Tampa's practice squad. The stop of the Eagles' Montel Harris was particularly pivotal on Saturday --- and Maryland saw the play coming. "The guards were kind of giving away their stances the whole game, so the two guards were pretty heavy up front," linebacker Alex Wujciak said. "I think we knew they were going to run the ball. Coach [Don] Brown had an awesome call for it." BC is 112th in the nation in total offense --- which happens to be the worst performance of any BCS-conference school. We are converting 26.7% of the time on third down. We have been absolutely shut down by the ND defense --- 81st in the country --- and the NC State defense, 47th in the country. There's only one ACC team that is even close to BC for offensive ineptitude --- Maryland. Maryland has converted 28.9% of third downs this season...so, they're not much better than us, perhaps owing to the fact that they too have a freshman QB. In fact, they weren't better than us until yesterday when they converted 10 out of 19 3rd downs. That stat, of course, does not include the 2 out of 3 4th downs they converted; those two were on the same TD drive, and one was a 4th and 7, where we gave up a nearly uncontested 8 yard pass. We have scored 14 touchdowns on offense this season. To pick a point of comparison, let's go with Dana Bible at NC State: they have scored 30 touchdowns. That is, the offensive coordinator that we wanted to run out of town has been more than twice as effective as Mr. Gary Tranquil. We have gotten 103 first downs this season, a little more than 14 per game. Thankfully, that doesn't make us the worst BCS conference team --- only second worse, as Vanderbilt is even more futile. Of course, I'm not sure we should be comparing the ACC Atlantic defenses to those of the SEC, but that's a more subjective matter. Maryland has only gained 104 first downs this year --- although that did not stop them from marching out to a 24-7 lead. So, if you thought you were watching a historically poor BC performance this season --- you are. I have not tracked back to the 1995 and 1996 D.H. seasons, and those (judging by the scores in our media guide) had a similar level of offensive ineptitude. But we are undoubtedly watching the worst offensive performance in more than 15 years ---- and quite likely in more than 20. Each game I personally chart each and every play noting whether it was a run or passing play and what type of personnel package was in the game. In the 2nd half I noticed something disturbing---Maryland cornerbacks were turned towards the line of scrimmage with their backs to the sidelines on 1st downs when they saw anything but 11 personnel on the field. I thought to myself that this was pretty gutsy. However after analyzing some data I can see why the cornerbacks were lined up like that. First, let's look at 1st down play calling. I took every first down play, regardless if the play was negated by a penalty or not to see if there were any trends. Out of 28 1st down play calls, BC had 18 running plays and 10 passing plays. Granted one of the running plays was actually a play action pass call that Rettig had to escape the pocket and run out of, but it might have been more effective to see that run to pass ratio closer to 50/50. Also, those statistics might be skewed a little bit since BC was forced to pass so much in the 4th quarter. My problem was less with the ratio of runs to passes on 1st down, but more with how they came. The Eagles started the game by running on 8 1st downs in a row. With Harris running pretty effectively wouldn't that have been the perfect time for a play action pass? Perhaps the most troubling thing to me though is how predictable the Eagles were with their personnel packages. Out of Rettig's 33 pass attempts, all but one was run with 11 personnel (1 RB, 1 TE) on the field. The one pass play not run with 11 personnel, came out of 12 personnel (1RB 2 TE). In 12 personnel BC had 1 pass attempt and 8 rushing attempts. Out of 21(2 RB, 1 TE) personnel the Eagles had 3 rush attempts, out of 22 (2 RB 2 TE) personnel they had 6 rush attempts, and out of 23 personnel they had 2 rush attempts. So let's break all of this down. When BC did not have 11 personnel on the field they had 1 pass attempt and 19 rushing attempts. If I can notice that do you think the Maryland defensive coaches did? Still think talent is the main issue here? The BC Club of Atlanta has gotten together with the Clemson Alumni for a happy hour tomorrow (Tuesday) October 26. It will be at the Taco Mac on Roswell Road (the old Frankie's). Clemson fans are always good people and you will probably be more happy with them now than you will be after Saturday. Taco Mac is also donating two $25 gift cards to the two best-dressed Eagle and Clemson fans. For any more details, hit up BCMike. Vanilla Ice at Ice Jam? 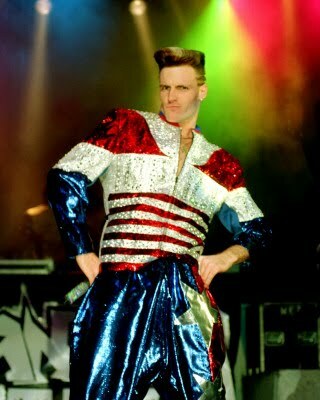 As I tweeted this morning, Vanilla Ice is scheduled to be part of Ice Jam. I've hedged a bit because this all just seems "to the extreme" (bad pun intended). I could be getting played, but my source was adamant. I don't know how it will go over, but you can't blame BC for trying something different. Some have said that I pin too much blame on Spaz and the coaching staff and not enough on the players. Watching the game back could certainly lead one to believe the players are at fault. They made numerous mistakes and got beat at key points. But some of those mistakes are because the coaches are not putting them in winning opportunities. And five straight losses are not because of talent or a killer schedule (see Notre Dame-Navy). Losing like this is mostly coaching. But there were some good individual efforts and a few nice moments from the coaches. However, I still think our in-game coaching, including pacing on offense and 3rd down defense are problems. Rettig's INTs weren't his fault. Momah tipped the first and according to the Globe, Swigert broke the wrong way on the second. But even though he was blameless on those, he still had some bad throws. As noted repeatedly he was behind on the slants and floated some other balls. He is also missing some open men and not going over the middle enough. But he is showing good progress and, in general, making smart plays. He also has good pocket presence. He was only sacked once and did a good job to step up and look to make something out of a broken play. Harris didn't have any big plays like last week, but put together a solid effort. Yes, the fumble was costly, but his overall contributions were more important. He made cuts when holes collapsed and also did his usually job of pushing the first tackle. His pass protection was good too. McCluskey got a carry! (It was actually a nice change of pace.) Williams and Phifer also got carries. Momah made a big catch in our comeback but is still letting too many catchable balls bounce off his hands. Swigert's catch off one of those tips was amazing. I keep hearing that our receivers have trouble with separation. It is not that simple. If you watch it back, you will see guys get a little space (like Swigert). But the windows are closed quickly, which means the WRs are just going to have to win one on one battles. Pantale had a solid day and could have been thrown too more. Coleman was fine. Phillips was involved in kick returns but didn't get a catch. Amidon was also silent. The offensive line was okay. The problem now is consistency. They will look good on one play and overmatched on the next. Castonzo gave up a rare sack. Claiborne played well but was also blown up on Harris' fourth down run. Spinney airmailed a snap that killed a drive. Yet even with those problems they were better. Castonzo-Richman-Spinney-Claiborne-Lapham is probably our best combo going forward. I actually didn't hate Tranq's playcalling. There were some good moments and he is finally using run plays that play to Harris and the line's strengths (like zones). He also had Rettig run out of the option. The passing routes still leave a lot to be desired. Calling the slants over and over when we had trouble executing was curious. I will have a post later today about our predictability on offense. My biggest problem with Tranq and our offense was tempo and pace. We were still very methodical down 14. I know we got it close, but we should have been passing earlier. This is my simple logic: 1. BC has trouble scoring points. 2. We've shown no ability to overcome a big deficit. 3. Increasing the tempo when down gives us more chances to comeback. Essentially we ran out of time. I also didn't like the fourth down calls in the fourth. You have to view those as 4-down possessions, so mixing things up on third down would have been more appropriate. I feel for Alex Albright. He was having a great season and now his career ends in crutches. If he had been healthy during his career, he might have been one of BC's all-time greats. In his place Holloway played well. Scafe also had a good game. Newman was very quiet. The rotations was tighter and hence the backups didn't get much attention. The LBs are now becoming a liability in the pass game. Herzy's great when he can rush the passer and disrupt the throwing lane, but I think he's having trouble covering space large spaces (like he did so well before his medical issues. He's a step slower so Maryland was able to get some short passes. With Albright out, I think we should use him as more of a stand up DE. His instincts around the QB are still amazing. KPL let some short passes keep drives alive. Kuechly didn't get burned this week and was very solid in tackling. Devitto played but most of the game was just the first teams LBs. After having such a great game, the DBs had a bit of a letdown. No big plays and too many short completions allowed. First I hope Davis is back quickly. BC needs him in the backfield directing traffic. Noel was quiet this week. Okoroha was fine. Gause was okay, but for some reason giving the other team too much space. Fletcher wasn't tested as much. Fox looked good in limited play time. There are conflicting reports over who is actually running the defense but whoever it is did not do much to help the team out this week. I know that they were left with a short field on some of the scoring drives, but in general, this scheme was in effective and also the adjustments weren't great. We couldn't get them off the field and couldn't really get pressure on O'Brien. Where were the different looks from last week? Why weren't we disrupting him more in the pocket. This is a guy who threw three picks last week. It is almost as if we said "let's play base and watch him fold." Instead he proved to be pretty accurate. Quilgey was fine. Freese was fine. We improved our kick coverage. Our punt coverage allowed one long return. I also liked seeing Montel on PRs and Shakim Philips on kickoffs. Might as well give our best players more touches! Once again we got down early. I am glad we came back but I wish we had increased the tempo early in the game. Methodical against Florida State makes sense. Against Maryland? Not so much. Plus once we started passing more, Rettig adjusted and started to get the offense to move. In my opinion the defense was as much of a problem. I know we only allowed 222 yards, but their efficiency on third and fourth down was frustrating. We have different looks, it is just a matter of when and how to use them. Spaz has been a DC for a long time. He knows that more than anyone. I the post game Spaz mentioned our razor thin margin of error and not having a winning edge. I hope those are just cliches he throws to the press and not what he really believes. This was not some Maryland powerhouse. If our in game approach is to play ultra conservative because or our "thin margin of error" this guy will never win. We have some play makers and smart players (just look at Swigert's instincts on the tip). We need to give them more opportunities at big plays and open things up a bit on both sides of the ball. There are plenty of factors that led us to this point, but there is really only one person who can save Spaz - himself. As lost as this season seems, there is still plenty to play for. I think he needs to do something with our approach to games. It is October and he's emptied the bench. Any player who could make an impact is on the field. Now let's find out what they can do well and do it over and over until then other team stops us. These kids are playing hard and deserve that much from the staff. I still think Frank Spaziani will be our head coach in 2011. I've always felt that only a 2-10 record (with 10 straight losses) would get him fired. But I think many share my opinion that he is not the right coach for BC. But most BC fans assume the school won't and shouldn't make another coaching change after just two years. The belief is that the PR hit and the shakeup would hurt BC more than another bad year under Spaz. I disagree. I think when you have the wrong guy in place, you are better off making a change. Find the right guy and people won't care about public relations or fairness. There is no better example of this than Stanford. Following three poor seasons from Buddy Teevens (2-9, 4-7, 4-7) they hired an established head coach in Walt Harris. Harris seemed like a good fit but went 5-6 and 1-11 in two years. Stanford realized their mistake and made another change. They brought in Jim Harbaugh and are now winning and recruiting like they haven't done in years. Do recruits care about past instability? Do fans clamor for the old days or say that Harris didn't get a fair shot? Of course not. Everyone has a short memory and is happy with Harbaugh. I don't know if Gene thinks Spaz is the long term solution. But I hope that if he no longer thinks Spaz is the right guy, that he doesn't hesitate to make a change. We try to emulate Stanford in so many things. Maybe copying their coaching turnover will lead us back to winning and exciting football. At this point you can just cut and paste my reactions from some of the other games. What is left to say? I do want to make note that I hope Wes Davis is okay. He's a great kid and embodies what is right with the program right now. I will hopefully have more thoughtful comments later. I was glad that we (and Chase) fought back, but there is still no justification for the overall performance of the team. Do people still think it is a talent issue? Or purely a raw QB issue? Maryland has a better record than us and they have shuffled QBs. I am looking forward to the excuses and Spaz spin. I will have my second viewing thoughts and grades late Sunday. I may also have any additional post late Saturday night (I feel some venting coming on). "Must wins" are sort of out the window when you are 2-4 but both teams really need to turn things around this week. I hope BC is the one to turn the corner. Because most of you will be watching the game online at ESPN3.com, feel free to pop over here during the game and leave a comment. You can also join the discussion on the Eagle Insider message boards. I will probably have a thought or two on twitter during the game. This game is on ESPN3.com which means most sports bars won't give BC clubs the time of day. I only saw a note for Chicago. Is any other club having something? Post it in the comments or let me know via email. The Under Armour team that designed the new basketball uniforms explained what they did for BC. I love the small details like the "Ever to Excell" stitching and the stained-glass inspired numbers. If you want to get an early look at the basketball team, check out their open scrimmage Saturday morning. Andy Katz has some quotes from Donahue at the ACC meetings. The PAC 12 will hold their Championship Games on campus. Why didn't the ACC do this from the start? Considering we are 4-1 in this ACC series, my fear of Maryland is not really justified. (The BCI guys have certainly teased me about it in the past.) The basis of my fear is that even in the lopsided BC wins it was more about our defense scoring off of turnovers as opposed to shutting down the Terps. Even last year's game against their worst team ever was ugly and decided in the final minutes. Maybe I am giving too much credit to Friedgen's offensive mind and not his current talent level. Let's hope my anxiety in not founded this year. BC needs a win Saturday if we want to turn things around. 1. Stop the run. This is pretty straightforward. In their two losses, Maryland's ground game was slowed and they were forced to try to win in the air. Since BC tries to stop the run weekly, this should work to our advantage. 2. Run with Rettig. This might seems risky since Rettig has a bad ankle and is our only hope. But I think him running three or four times out of the zone option will open all sorts of things for Montel. 3. Blitz pick up. Maryland is going to come hard after Chase. It will be up to Montel and the the Tight Ends to help out. The WRs will also need to read the blitz and adjust their routs accordingly. This is the first meeting of two ACC Under Armour teams. Clemson is our next opponent so their game against Georgia Tech has extra importance. Although they are coming off a win, the Tigers are still in a rough place. If they lose to Georgia Tech again, I could see things falling apart by the time they play us. Chase Rettig take the next step. I know it is only his second game, but I do hope that he can start to make more plays. He needs to find more of the open guys over the middle and move the ball in the redzone. We keep getting field goals in the redzone. Getting three points instead of seven has been costly already. I fear more of the same issues if we get bogged down again this weekend. I don't think it will be easy, but I do think BC will win this weekend. I expect the defense to force O'Brien into some mistakes and turnovers. I think Rettig will be better. I predict BC takes control in the second half and gives us hope for the stretch run. Everyone is concerned about our basketball depth (preview 1, preview 2) but I think we will be okay with a short rotation. I think the bigger concern is how we adjust to the new style of play. BC finished 10th in the preseason poll. Jim Noel is hoping to build on his performance against Florida State. For recruiting information on BC targets: John Harris, Jarron Jones, and Leantoe Carroo. Hoping for a second chance in the NBA, Sean Williams is working out with the Dallas Mavericks. You would think that after a decent start things would be good down in College Park. But a lopsided loss to Clemson has Maryland fans wondering if another collapse is eminent. To get a feel for things, I've asked Scott from Theterrapinnation.com to guest blog this week. My questions and his answers are below. ATLeagle: Friedgen threw his players under the bus after the Clemson game. Was it deserved? Do you think they will respond? The Terrapin Nation: Ralph Friedgen's tirade was absolutely uncalled for. For several years now he has gone into a presser after a loss with excuses galore. He says they are young, he says the players have to make plays, he's always laying the blame with anyone but himself. On offense, while MD is starting a freshman at tackle on the offensive line and a freshman at quarterback it's still the responsibility of the coaches to put the players in a position to succeed and personally I don't feel they are doing that. ATLeagle: Don Brown was known for his aggressive blitzing. Now in his second year, has he tweak his scheme at all? The Terrapin Nation: Oh, believe me, Don Brown is still bringing the blitz package every week. Having said that, the Terps are really struggling with it, namely due to poor recruiting on the defensive line. The Terps get virtually no push up front on a lot of plays. Kenny Tate and Antwine Perez are one of the best safety tandems in the nation and Don Brown likes to bring them on blitz packages quite often. But like I said, they have a really hard time getting to the quarterback for the strip or the sack due to a lack of push in front of them. One adjustment that seems to have not been made that I think should be is to find a way to help the linebackers out so they are not stuck in 1 on 1 coverage so much with some of the backs and tight ends. As much of a tackling machine as Alex Wujciak is he sometimes needs help in coverage. I think running more zone would really help mask this deficiency. ATLeagle: How much of a hotseat are Fridge and Franklin on? Did the AD change buy Ralph more time? The Terrapin Nation: At this point the entire staffs seats are absolutely on fire. Friedgen did a tremendous job coming in and winning immediately at a school that had been terrible at football for more than a decade. But the results have simply not been there over the last six years. Since 2003 the Terps are a game under .500 overall and 20-31 in ACC play. The lack of creative play calling and a defense that gives up huge chunks of yards has also really turned off fans. Attendance has been abysmal so far this season. As for James Franklin I really believe he is probably soon on his way out of College Park. His play calling is absolutely baffling at times and the decision to bring Jamarr Robinson in for a single play on possessions makes absolutely no sense. He has been given the 'Head coach in waiting' tag, but I fully expect the Terps to buy him out either this season or next. At this point Ralph only has one more season after this on his contract. So I think its safe to say either this season or next will be his last. To date, Kevin Anderson's claim to fame has been his hiring of Rich Ellerson at Army who is poised to take the Black Knights to their first bowl game since '96. I expect Anderson to be looking to put his own stamp on the program with his own hiring of a new coach. On top of that, Franklin's offense has not impressed and at this point he's associated with one of the worst seasons in school history. Factor in new luxury suites at Byrd Stadium and Kevin Plank and Under Armour wanting to see a winning program for their flagship University and I think it all adds up to a new regime very soon in College Park. ATLeagle: What is your prediction for the game? One of BC's top targets Brandon Clemons has BC and Pitt in his top two. Clemons has yet to schedule an official visit but plans to after his season is over. Robert Trudo, who seemed like a great fit for BC, verballed to Syracuse. Another BC target is Trayion Durham heading to Wisconsin. Maryland thinks this is a "must win" game. HD thinks we can rebound from our recent slide and make a bowl game. The one positive of the noon game is that I get into football mode early and often get to watch a lot of different games. This weekend I caught the end of the Auburn-Arkansas game and it certainly influenced my ballot. I have the Tigers as No. 2. I am still keeping Oregon No. 1 and continue to slight Boise. Even though BC played Florida State close, I think the 'Noles are pretty good and will probably cruise to the ACC Championship Game. The Clemson game will have a noon kickoff on the ACC Network (aka Raycom). Sadly this could be our last televised game of the year. We need to start winning if you hope to see Duke, UVA and Wake on anything other than ESPN3.com. Syracuse has a chance to be on real TV. The hockey season started in a strong fashion with a series sweep over Denver in Colorado. It is interesting that both the beat writers took the bowl eligible storyline today. If they are saying that, it means the staff has hope even if general expectations have been lowered by the losing streak. Former Eagle Tony Sanchez has a blog on MLB. HD moved us up in her power rankings. I don't know how things were where you watched, but pacing returned to the ATLeagle house this weekend. That is a good thing. It was nice to have game that was still in doubt in the 4th quarter. But we are well beyond moral victories and need to play better. I also hated watching Florida State eat eight minutes of clock to put the game away, especially after we killed clock on them the past two years. There were lots of positive notes and accolades to go around, but the big story is what Rettig didn't do. He didn't force many bad passes. That is a good sign for a QB. I don't know how fast he will mature and if he can save the season, but I think we can all agree the right QB is finally playing. As I mentioned Rettig was poised. Even on the second play of offense he and Harris had some sort of miscommunication and he took the sack. It was a bit of a drive killer but a turnover would have been worse. And as the game progressed he started to buy a little time (the long pass to Swigert). His throws weren't bad in general. He missed a few open guys but overall showed good decision making and decent accuracy against one of the better defenses will will face this year. It is still way too early to tell much about his future but I do think he showed glimpses of competence. He also needs to throw more of those intermediate balls over the middle. They were there and he has the accuracy. And he and Tranq need to let him run once or twice a game on those zone-option plays. They are wide open for him to get positive runs and will help Montel overall. I can't believe that some people are getting on Harris for getting caught from behind. The guy carried the team on Saturday and had his best game in weeks. Aside from the long runs, he had some tough carries where he pushed for extra yards. He also did a good job in pass protection. Phifer dropped a catchable ball. Williams had a nice run. We used less I-formation so McCluskey wasn't on the field as often. While others have been calling our WRs mediocre, I've been one of the few claiming they are a deep and talented group. This game didn't help my argument. Florida State's defense is good, but I think the WRs could have done more. Sharper breaks. Adjusting a route. Coming back to the ball. All the little things that might have helped Rettig. Momah had two different redzone passes that he should have come back for. Swigert was okay and probably did the best job of creating space. Phillips looked okay in limited action. Pantale was good and needs to be one of Rettig's main targets. Anderson was okay when running routes but he had a rough day blocking. There were a few different plays when Anderson either got blown up or beat by FSU LBs and DBs. Due to injuries this was our offensive line for most of the game (LT-Castonzo, LG-Cleary, C-Spinney, RG-Claiborne, RT-Lapham). That should probably be our lineup going forward. They played better than they have in weeks. They got good push. They got to the second level. The tackles still had trouble in pass protection but did well enough to give Rettig a little time. Claiborne had a stupid penalty but he was crisper than he's been. I expected more holding calls with their pass rush, but our guys did a good job. Spaz has talked a lot about the Center change having huge impact. Not to slight Richman, but maybe Spinney should keep the spot and shuffle Richman back to G.
I appreciated the simplicity of the game plan. We played to our strengths (not much I). We used the zone option and the stretch runs where he can pick his hole. We also gave Rettig many safe plays. Yet we also had a few new wrinkles (like the Pistol). As for in game management, I didn't mind sticking with the run. I've been calling for ultra conservative gameplans for weeks and it worked for the most part. My problem though is in adjustments. Florida State started crashing down on the runs and we didn't really counter. They also jammed our WRs and we didn't run many combos or routes that might get the a little space. And our redzone play calling remains really ineffective. Why not have Rettig roll a bit or play fake? Albright's comeback continued (although he faded a bit in the second half). Ramsey was good. O'Neal was good. Newman was active (and solid on special teams). The real surprise was Edebali. He chased down Ponder and showed good contain. Holloway was okay, but he lost contain on FSU's big reverse on the final drive. Quinn is hustling but didn't make a big impact. Kuechly played really well -- although he bit on the play action again. KPL also let his man run free on FSU's first TD, while he tried to close on Ponder. I understand that both of these guys are fast and aggressive, but they need to be bit careful on those sorts of pass plays. Herzy is still making an impact. Aside from the tip there were a few other balls he forced bad throws on. I actually like the idea of him ruining a QB's line of sight and think it will produce more opportunities as we face bad QBs. Morrissey played a bit and missed a tackle. Devitto didn't see much time. Clancy and Thompson were playing on special teams again but not much live action. The DBs were outstanding. Davis was good in run support and didn't allow any big plays. Gause had some nice tackles, but the game belonged to Fletcher and Noel. Fletcher was in Ponder's head most of the game, because he was reading those short outs very well. His INT was a great one on one play. Noel made some big hits and obviously had great instincts on the turnovers. For years we complained about our vanilla scheme. That is changing a bit this year. We had numerous sets with just three down linemen with Albright and Herzy in two point stances on the ends. Sometimes they would both rush. Sometimes one would drop into coverage. It kept FSU off set and force Ponder into bad passes. We also played our normal zone behind it and made some plays there. My biggest frustration with the defense came when we couldn't stop them in the fourth quarter. As a DC, you've got to try something high risk and hope for the best. I criticized Momah earlier, but he was very good on special teams and made multiple plays on our short kickoffs. Gause has guts and isn't fair catchig everything...just wish he was more elusive. Quigley had an inconsistent day, but I think his positives outweighed his two shanks. Freese was money and is a nice asset. The biggest problem was giving Florida State a short field. I understand wanted to keep it away from Reid, but clearly Florida State adjusted and by the fourth quarter Reid was catching the pooches. Things were better but as I've said still not good enough. We still need better redzone play and I still wonder about Spaz's game management. Like the pooch kicks. Don't you want the other team to have to drive the whole field when you have a lead? Don't you trust your special teams enough? I think starting Rettig and keeping him in there was the right move. Now he just needs to get him better play calling. Even with all the disappointment, we still have plenty to play for. Spaz has to show that he can stop the bleeding.